I’m not a fan of the Conjuring films. Not because they are bad films, but they scare the bejeezus out of me. The success of both films have given way for spinoffs, and thus launching what is known as The Conjuring Universe. Following the success of two surprisingly good Annabelle films, comes The Nun. The portrait which appeared in The Conjuring 2 is getting its very own spinoff, which isn’t in the same vein as the Annabelle films, but it does give us pause as to why we keep inflecting scars on ourselves watching these terrifyingly good horrors/thrillers. Check out the first trailer below. Directed by Corin Hardy, The Nun is the third spinoff in The Conjuring Universe, joining the two Annabelle films. But no one could have foreseen this happening. In fact, horror spinoffs have a reputation of being terrible films. And yet, anything from The Conjuring has proven us wrong by being very successful. 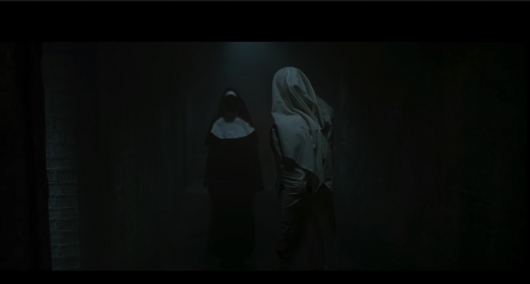 And one of the most surprising things about The Nun is that it already looks good right off the bat. It’s chilling and offers the right amount of suspense before getting into the jump scares. But it is going to be even more interesting to see how this film connects to the universe as a whole. If you haven’t watched Annabelle: Creation, you are going to see how that connection is established. Plus this looks like it relies more on practical effects than CGI, which is something I believe we can all appreciate. But has been common throughout these films. So hopefully it is a practice that continues on as it continues to expand. As for the trailer, well it pretty much speaks for itself. The fact that it is prefaced by “Make Sure You Stay Until The End” tells us that there is something waiting for you at the end. And you won’t regret it. Or you may. Just don’t hate me for it. The Nun stars Taissa Farmiga, Demián Bichir, Charlotte Hope, Ingrid Bisu, Jonas Bloquet and Bonnie Aarons. Filmmaker James Wan, director of the record-setting horror hits “The Conjuring” and “The Conjuring 2,” explores another dark corner of that universe with “The Nun.” Directed by Corin Hardy (“The Hallow”), the new fright-fest is produced by Wan and by Peter Safran, who has produced all the films in “The Conjuring” franchise. The Nun opens in theaters on September 7, 2018.